It was a steamy day in the Philippine lowlands of eastern Mindanao. It had rained heavily during our two-hour jeep ride to the remnant forest, and then we'd been walking for hours, taking cover with each passing rain-shower. By late morning our little group was strung out along a half-abandoned logging road, trudging uphill for some time, and then down into a little swale. I was alone between segments of our party at the time, but suddenly I 'felt' like something was watching me to the left. Or perhaps I had seen something fly up to a perch in the woods to my left out of my peripheral vision. I stopped, turned, and was confronted by this amazing bird (left): a male Mindanao Wattled Broadbill, This was one of my 'most wanted' endemics from the Philippines and the joy of finding it — or of it finding me — was quite wonderful.... And then to get photos!. Next to the Great Philippine Eagle, I consider the two species of Wattled Broadbill in the Philippines to be the most special birds of that magical archipelago, and the highlight of any trip. Broadbills are among the most spectacular birds on earth but most are exceptionally difficult to observe. This combination makes them perhaps my favorite or all families of birds. Or I should say: my two favorite families of birds! Because the recent DNA evidence (Moyle et al. 2006) shows that two lineages of broadbills diverged about 55 million years ago and have been on separate evolutionary paths ever since. One lineage evolved into the green broadbills of Asia (Calyptomena) and the lowland broadbills of Africa (Smithornis; together they now form the Calyptomenidae), while the other lineage had further branches. First a New World species, the Sapayoa, split off about 52 million years ago, then the Asities of Madagascar perhaps 46 million years ago (Prum 1993 had shown that Asities were 'nested' within the old-school broadbill assemblage), leaving a set of mostly Asian broadbills (including the Mindanao Wattled Broadbill; a female is shown to the right) and Grauer's Broadbill in Africa (more on that below). It is remarkable that both lineages of broadbills — which I treat as two families here — both have Asian and African components. However, in both cases, most of the species are Asian. I recall being overcome with wonder while looking through a drawer full of specimens for Borneo residing at the Western Foundation of Vertebrate Zoology. They were "salvage" specimens — that is, they were collected by ornithologists in lowland forest slated to be clearcut in the near future under the horrendous logging practices of Malaysia and Indonesia. Rather than losing the birds along with their habitat, they were "salvaged" to provide important scientific specimens. The Banded Broadbill Eurylaimus javanicus wore a subtle mix of gray, yellow and pinkish-red, while the Black-and-red Broadbill (below) was a gorgeous clash of crimson and black. These two species also had particularly impressive broad bills, as is nicely shown in the sequence below: video captures of Black-and-red Broadbill in Borneo by Rita Carratello. Eurylaimid Broadbills live in the subcanopy of the Old World tropics: 8 species in southeast Asia, the Philippines, and Borneo & Sumatra, plus the one in central Africa. Most are lowland birds although some are highland species, such as Long-tailed Broadbill Psarisomus dalhousiae of s.e. Asia and the Greater Sundas. Asian broadbills are generally located by their calls. That of Black-and-yellow Broadbill (right) is a very unusual, accelerating cacophony that proves to be a characteristic sound of the Bornean lowland forest. Once learned, this species proves to be quite common. But it usually remains difficult to actually see its lovely mix of pink, yellow, and black patterns. In Danum Valley, Borneo, both Banded and Black-and-yellow Broadbills proved to be much less rare than supposed once their calls were learned. All are responsive to tape playback but may still prove frustrating difficult to locate in the leafy forest above. Eurylaimid Broadbills eat primarily flying insects that they catch from their subcanopy perches, although they will also take a variety of fruits (some species are more fruit-eating than others). They build elaborate, hanging, purse-shaped nests. 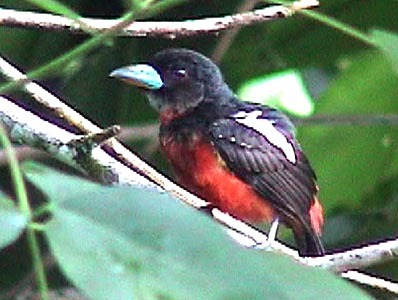 Black-and-red Broadbill drape their nests over quiet forest backwaters and streams, and can often be found around the water's edge. 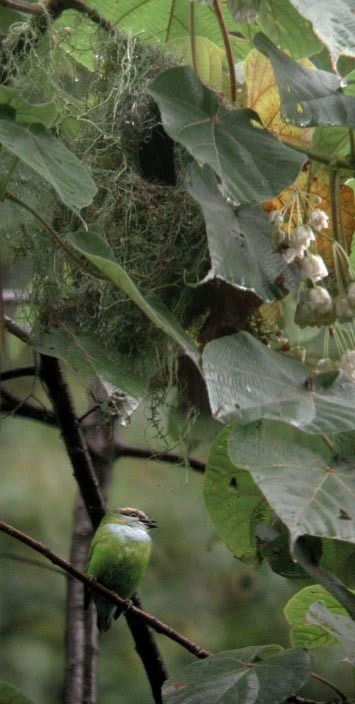 The nests of the Eurylaimid Broadbills — and of Asities and Sapayoa — are globular masses suspended 10-30 cm below a branch, and the entrance is on the side of the nest. 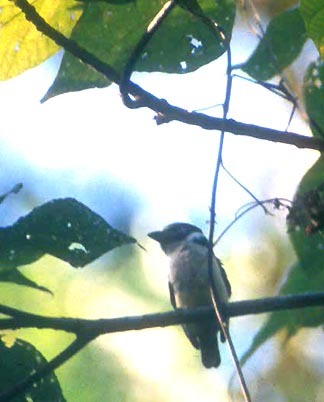 In this respect they differ from the Calyptomenid Broadbills whose nest is suspended closer to the branch, and the entrance of which is at the top of the mass (Prum 1993, Moyle et al. 2006). Grauer's (or African Green) Broadbill is the only Eurylaimid Broadbill in Africa (left in a wonderful photo by David Fisher of an adult at its nest). It is endemic to the Albertine Rift at the intersection of Congo, Uganda, and Rwanda. It is amongst the most sought after birds in Africa. It has recently been found regularly in Mbwindi Swamp in Bwindi-Impenetrible Forest park in s.w. Uganda. David Fisher's photo is from that locale; researchers took his group to two nests in July 2006 [and David's photo is actually a combination of two shots — the nest and the bird carrying food]. Unfortunately, I missed it on my own day visit there several years earlier, despite having a local expert guide. My guide had found a nesting pair just a couple months before but the young had just fledged and the birds dispersed. It does not have the broad bill of other species but looks rather like a tiny green puffbird sitting quietly in the forest canopy. Unlike other broadbills, graueri has a thin, soft, high-pitched note. Grauer's Broadbill diverged from the Asian broadbills in this group about 35-45 million years ago, but is more closely related to them than anything else (Moyle et al. 2006). Asities and Sapayoa are more ancient lineages along this same evolutionary branch. Thus its lineage is less ancient than the Calayptomenid Broadbills, Asities, or the Sapayoa. However, one way of categorizing the evidence is to further separate out this wonderful little bird as a monotypic family, leaving only the remaining Asian genera in the Eurylaimidae. Another way of categorizing the evidence is to consider all the broadbills to be just one family, but in that approach one must lump the Asities and the Sapayoa with them. I prefer the approach that highlights the diversity of this group and the long evolutionary lines of each clade, but some taxonomists prefer to emphasize relationships and thus lump all of them together. In the latter case, Sapayoa would be a remnant broadbill in the New World. Time will tell which approach gains wide acceptance. For the moment, I treat this assemblage in a similar manner to the SACC approach to the barbet/toucan evidence, and emphasis diversity by maintaining four families: Eurylaimid Broadbills, Calyptomenid Broadbills, Asities, and Sapayoa. Photos: The Mindanao Wattled Broadbill Sarcophanops steerii was in the PICOP forest of Mindanao on 27 Dec 2005. 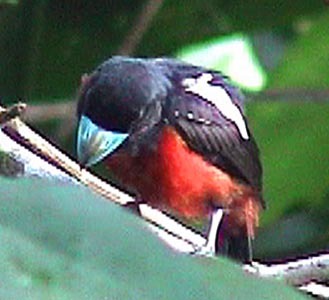 The Black-and-red Broadbill Cymbirhynchus macrorhynchus was video taped by Rita Carratello at Borneo Rainforest Lodge, Danum Valley, Sabah, Malaysian Borneo, in August 2003, and then she provided these video captures from the tape. The Black-and-yellow Broadbill Eurylaimus ochromalus was taken along the access road to Gomantong Cave, Sabah, Malaysian Borneo, on 31 July 2003. The Grauer's (African Green) Broadbill Pseudocalyptomena graueri as photographed by David Fisher in Bwindi-Inpenetrable Forest National Park, Uganda, in July 2006. All photos © Don Roberson, except those attributed to David Fisher and Rita Carratello, who hold those copyrights, used with permission. All rights reserved. The Handbook of the World volume covering this family (Bruce 2003) was, as expected, spectacular. But they also did not anticipate the findings about the true relationships in this group.